What is it? Hydrophobicity Grapher graphs the hydrophobicity/hydrophilicity of a sequence of amino acids, using a sliding window. The window size can be specified by the user, and several hydrophobicity scales can be used to determine the plot. Select Hydrophobicity from the VBRC Tools drop-down menu (top left of page). Click the Launch Program button. Hydrophobicity Grapher will be downloaded to your computer and Java Web Start will automatically start the program. Click here to go directly to the Hydrophobicity Grapher page. What next? The Hydrophobicity Grapher window shown below will open. 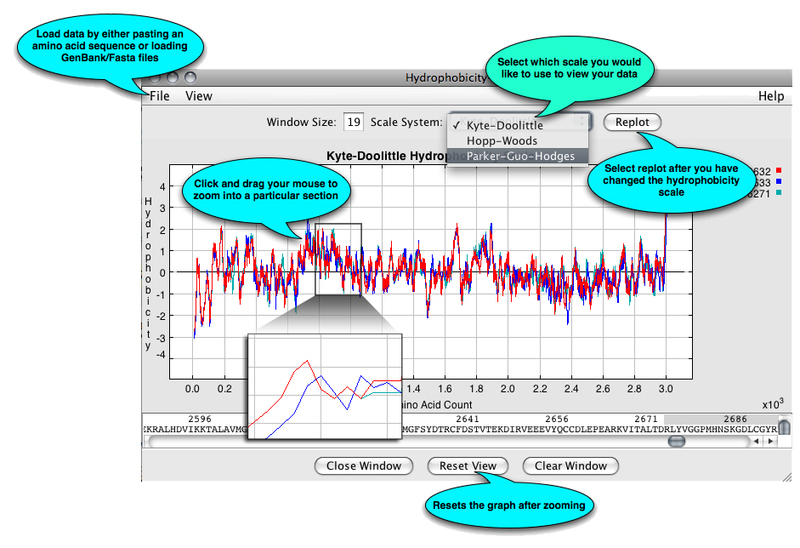 From here you can add sequences and view them using the different hydrophobicity scaling systems.